may your day be merry and bright. Christmas has always been one of my favourite times of year. 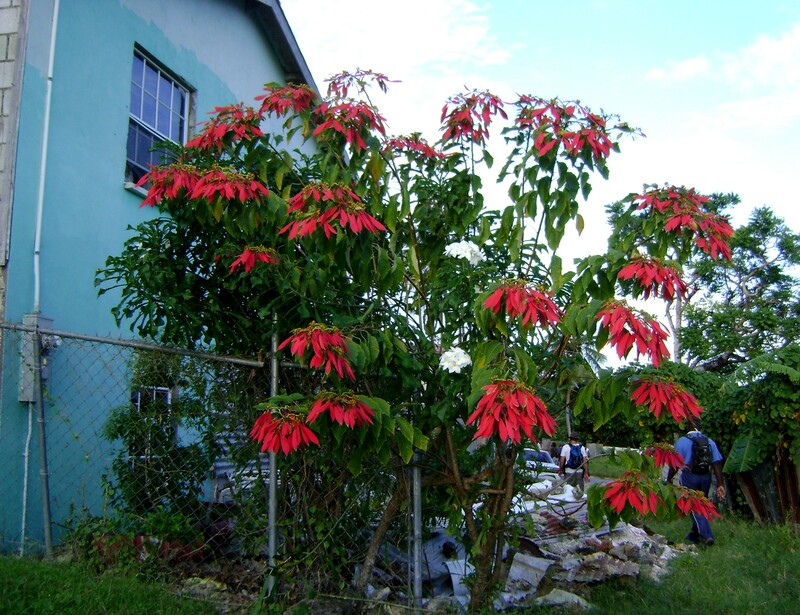 Even when I was a floral designer (and seldom came up for air in December), I made sure to decorate my house. Every year, I tried something new, certainly a lot easier for me when I was in the trade. When Ian gave me the news about the posting in Barbados, I made sure to pack some Christmas ornaments. Since I have some in every colour, I decided to bring only the watery colours, blues and greens with a healthy helping of silver. 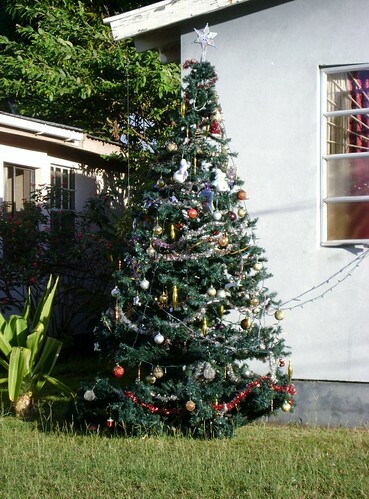 Although they sell real Christmas trees in Barbados, (not sure how long they would last, or can you even imagine how long ago they were cut), we use something a little closer to home for our Christmas tree. Hoping that everyone has a safe and very merry Christmas. No need to worry about needles in the house this way, lol. Thank you, thank you all for sticking with me through the upheaval (and bit of silence) in my life. Your support and continued friendship mean a lot to me. I hope that everyone has a very, merry Christmas (I will toast all of you from the beach,lol). Look what I found when we were on a hike, enormous or what! I hope everyone has a Happy, and Healthy Christmas. I would like to thank everyone who has made me feel so welcome since I started this blog. Thank you for all your kind words, helpful comments and constructive criticism. I hope that you continue to support and encourage me in 2010. This is a very busy time of year for me. A lot of companies seem to all have their Christmas parties the middle of December. And a lot of people are looking for gifts as well. As promised, here are a few things we have been working on. A mix of amaryllis, paperwhites and cypress. Helleborus are starting to be sold as a blooming potted plant at Christmas for the first time this year. Here it is planted with the cypress. Here they are planted by themselves. I hope that my Secret Santa gives me one of these. Paperwhites, cypress, stephanotis hoops and frosty ferns have pinecones nestled in a bed of moss. A vase arrangement of cymbidium orchids, magnolia, bc cedar, pine cones and oregonia. Now some flower arrangements. Amaryllis and leucadendron with a few paperwhites, commercial mums and gold pinecones. The same flowers as the arrangement above, but with roses instead of mums. An arrangement to go with the centerpieces above. This is for the bar. A very tall arrangement needed for a Christmas party. We used cello in the base to raise the flowers up. Add water, and it looks like ice. We will often use a large leaf to line a vase, this hides the water (if it gets murky) and is a different look from just a clear vase. Another party waits to be delivered. One more week to go….. This is the centrepiece to the Christmas decorations in the flower shop this year. I was inspired to show it to you in more detail after reading Christine at Idora Design post about Manzanita. We get these branches in from California with the bark sandblasted off. They were used for a few years in their natural state, before we decided to paint them silver for Christmas. I love these branches, they are so architectural in their shape, and make quite a statement. These are big branches, about five feet from bottom to top. You can get much smaller ones as well. We had to put some big stones in the base of the galvanized container they are sitting in. You need the weight to stop it from tipping over. Then did the usual stuffing chicken wire in and hiding it with sheet moss. We had these up last year as well, wound tiny white lights around the branches and hung silver and crystal ornaments from it. This year, a more natural look, no lights and there are moss balls hanging from ribbon tied to the branches.